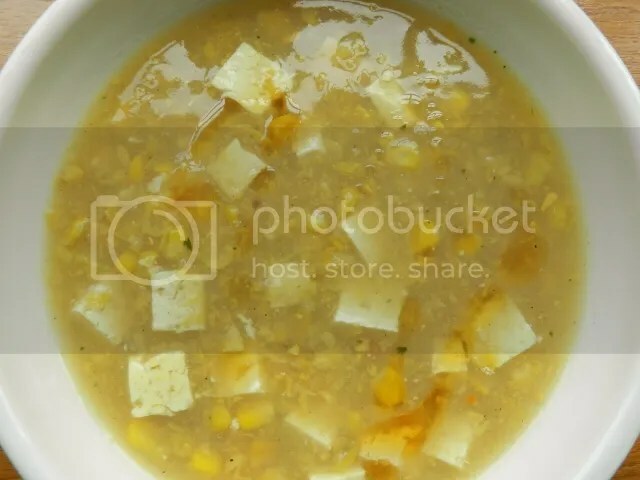 Yes, I know it’s another recipe with sweetcorn in it. I promise this is the last and I will just step away from the sweetcorn for a good long while now. I had these for lunch at a restaurant this week and had to try and make them myself. 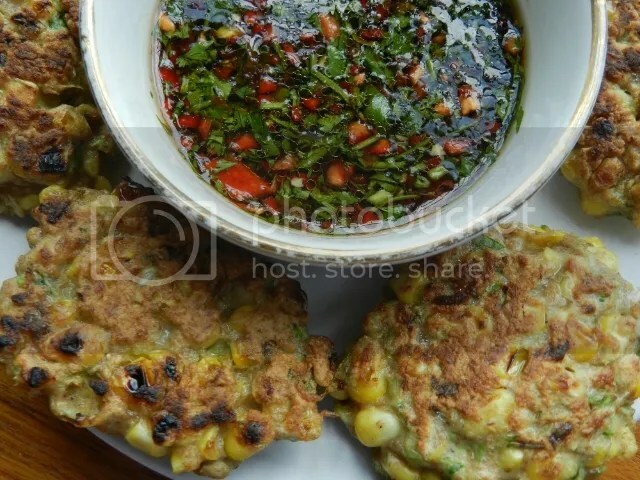 I’ve always loved Thai fishcakes and I have missed them a bit since I went veggie. I think I might just like these better though, they have more texture than the fishcakes and you get these little bursts of sweetness as you bite into a kernel. 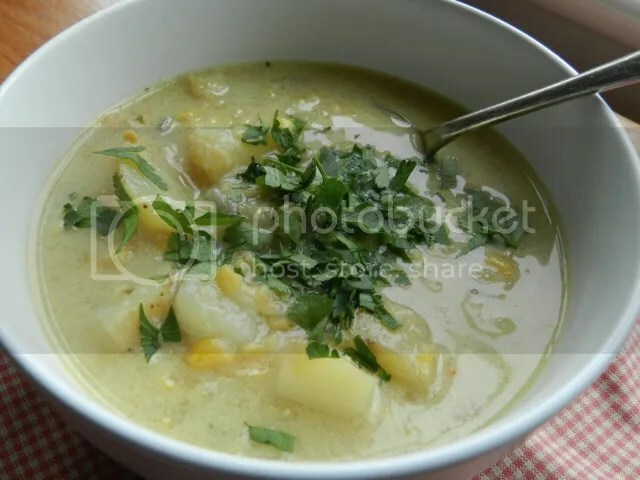 They’re considerably cheaper than fishcakes too, even if you get the fresh corn from cobs. I’ve kept the spicing in the fritters low-key so the sweet crunch of the corn really stands out. It’s the dipping sauce that has all the zing and heat. The sauce will also go with lots of other oriental style nibbles. Put the ingredients for the dipping sauce in a small bowl and mix thoroughly. Set aside while you make the fritters. Put the dry ingredients for the fritters in a bowl, season with salt and pepper. Stir thoroughly. Add the egg and flour and mix until they are properly incorporated around the dry ingredients. Heat a little in a pan over a medium heat. Drop about a tablespoon and a half of the mixture per fritter and fry until golden on both side. The mixture should make about 6 fritters. When they’re cooked, put the fritters on kitchen paper to drain off any excess oil. Serve the fritters with the dipping sauce alongside in a shallow bowl. This is just a quick salad I made from an idea on the Running with Tweezers blog. 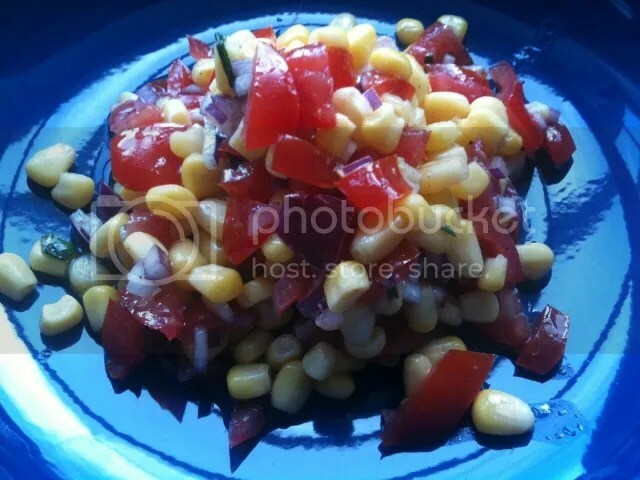 Sweetcorn and tomato seems like an odd combination but it works really well. I swapped red wine vinegar for lemon juice because I wanted a fresher tang. I used tarragon here, but mint or basil would work just as well. Put the ingredients in a bowl, season with salt & pepper and mix thoroughly. Leave to stand for half an hour at room temperature before serving. I know that this is summer and everyone should be eating fresh salad stuff straight out of the garden, but I think there is still a place for something quick and tasty that uses store-cupboard ingredients. Especially when the weather rains off the picnic on the lawn! 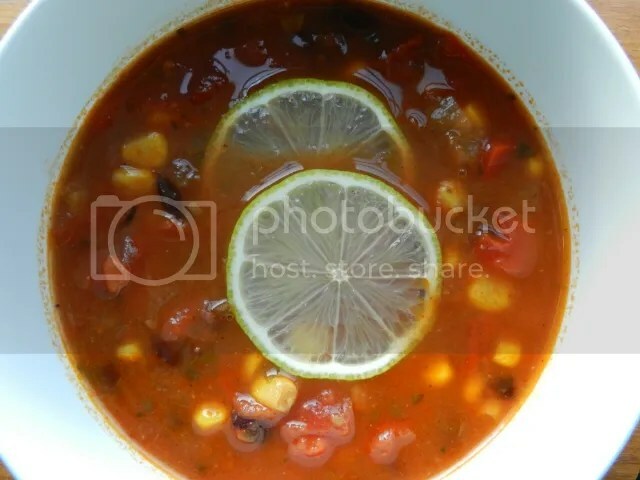 This is practically a store-cupboard soup, if you omit the red pepper and lime, but it is full of the gutsy flavour of a good chilli. 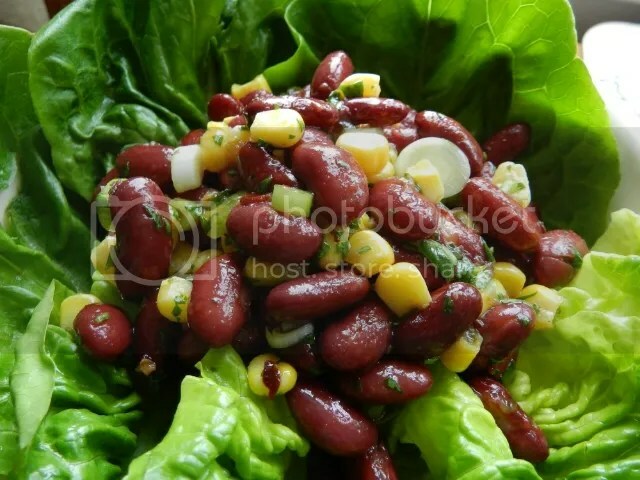 I have used black beans here, but red kidney beans or adzuki beans would be perfectly good substitutes. This recipe is dairy-free, but you could add a grating of cheddar cheese instead of lime as a garnish. Sweat the onion and pepper in a little oil until the onion is translucent. Add the garlic and stir for a couple of minutes. Add the spices and stir until the vegetables are coated in them. Add the rest of the ingredients apart from the lime. Simmer for half an hour. Serve with the lime slices as garnish.